The stage for Told by an Idiot’s latest show is decidedly wonky. Michael Vale’s white platform design is raised at one side, the other side sloping dangerously downwards; the props that sit on it valiantly fight against gravity, occasionally losing and sliding helplessly down the smooth surface. It’s an off-kilter setting for an off-kilter show, a cheeky nod to the zaniness and confusion to come. It also creates an inbuilt sense of battle, of upward struggle. The performers must always climb uphill or come tumbling down. 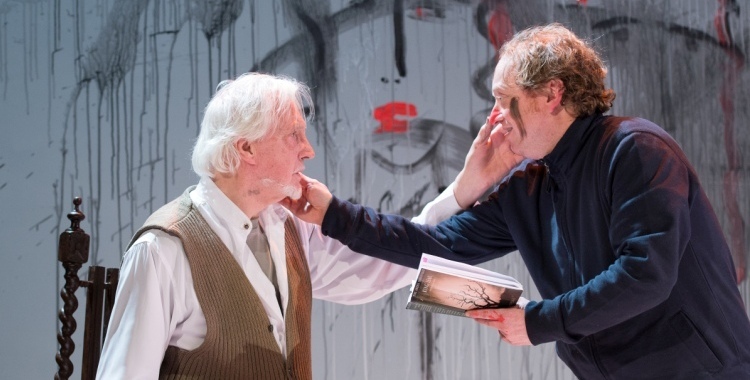 The defiant yet playful struggle in question is that of actor Edward Petherbridge, who in 2007 suffered a severe stroke just two days into rehearsals for a production of King Lear in New Zealand. What he has constructed together with Told by an Idiot and presented on stage with co-performer Paul Hunter is a recovery of sorts, though it’s never quite that simple. Instead, this is a piece of theatre as complex, messy and densely layered as the mind itself, jumping frenetically from memory to fantasy to present thought, barely pausing to take a breath. The result is a mad blend of stream of consciousness and wacky comedy, a gloriously surreal journey through Petherbridge’s experience that ends up being as much about theatre as it is about the human mind. With an acting career spanning more than half a century, including a stint in Laurence Olivier’s National Theatre Company in the 1960s, it’s somewhat inevitable that an excavation of Petherbridge’s mind will be teeming with theatrical anecdotes. Olivier himself makes regular, hilarious cameos, while other names that Petherbridge drops with relish include Noel Coward and Ian McKellen. More than just a series of wistful showbiz reminiscences, however, My Perfect Mind also unpicks the very concept of drama, staging a constant slippage between several different overlapping fictions and realities. In this sense, the workings of theatre reflect the workings of the mind; we, like the performers, are always negotiating a number of different identities, always treading a delicate line between truth and imagination, with the two sometimes indistinguishable. The most prominent of the fictions being juggled is King Lear, the text of which is studded throughout the show that Petherbridge, Hunter and director Kathryn Hunter have pieced together through devising and improvisation. This element of the piece is tragic in more than the Shakespearean sense, as we’re frequently confronted with the spectacle of a man snatching at a role that was cruelly wrenched away from him. The show is both Petherbridge’s chance to finally be Lear – at times with mournful, compelling commitment – and his poignant admission that this dream role will most likely continue to elude him. Instead he’s offered a fool’s version of Lear, in which the tears are just as likely to be induced by laughter as sadness. And it is very funny. Told by an Idiot’s distinctive brand of humour is madcap and chaotic – all wigs and clowning and racing around the stage. On paper, it doesn’t sound like a neat fit with classical actor Petherbridge, but in practice it works beautifully. He and Hunter make a fantastic if unlikely double act, Petherbridge veering between unabashed, self-mocking luvviness and wearily sardonic asides, while Hunter is every inch the witty, mischievous fool, rapidly switching roles to play all the other figures populating Petherbridge’s memories. It’s rough around the edges, revelling in its own thrown together quality, but always knowing. Beneath that archness there’s also something tender and quietly hopeful, recognising the fragility of human life while celebrating the reviving reinvention of the stage. At the heart of it all is a theatrical cliché made fresh by its own promise of renewal: the show must go on.